« What Tim Says: Contact Your Senators Now About HCR. Most of the way through the Greatest Apple Announcement Ever and the#ipad twitter series is deeply fixated on the awesomeness of the fail in giving the new device a name that is such a short leap from a product that has little to do with computing, and a great deal to do, as one of the Twitterers noted, with the desperate shortage of possessors of double x chromosomes in the tech biz. This entry was posted on January 27, 2010 at 2:11 pm and is filed under Cool Tech, geek humor, Technology. You can subscribe via RSS 2.0 feed to this post's comments. I really don’t see the attraction to this thing. It’s basically a giant iPhone without the “phone” part. Though since the iPhone is pretty lousy at being a phone, maybe that’s a good thing? …and the connection to Ms. Lovelace is..? Was she married to Charles Babbage of difference engine fame? Hence, I use her as an example of one of the too-few high ranking women in tech. A little visual joke, but mine own. Also — not married to Babbage, but a correspondent and F2F acquaintance/friend of same. She was Byron’s daughter and married a peer. 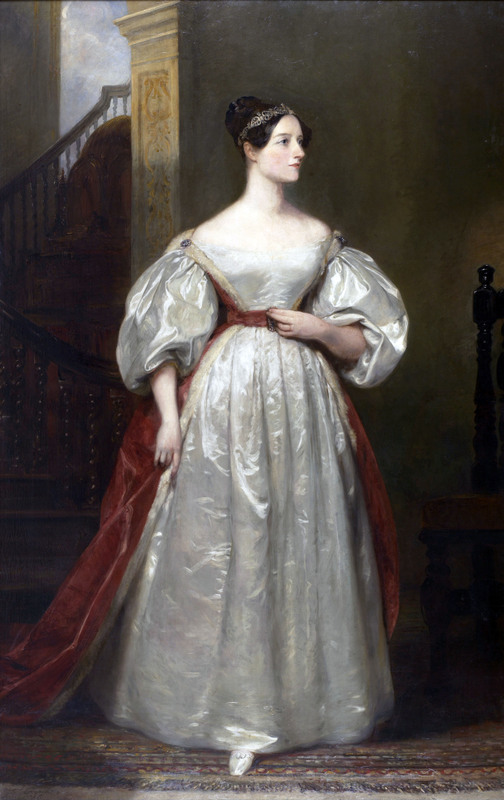 Thanks for the memory refresh on Ada Lovelace. I think I read about her in Jacquard’s Web, a book I imagine you know. If not, you’d probably like it – it was quite good.